World leaders gathered in Paris in December to forge a global agreement to limit planet-warming carbon emissions. Similar summits had been held before, but the summit was the first this century to end with an international agreement. The U.S., China and other countries will sign the document into law on Friday – appropriately enough, Earth Day. The Paris talks were attended by thousands of delegates, including four undergraduates from the University of Washington. At the time, UW researchers in Seattle applauded the expansion of discussions to include public policy and human health, and emphasized the need for a timely, durable international agreement. Now, a few UW faculty members comment on the signing as countries move toward implementing its contents. Dennis Hartmann, a UW professor of atmospheric sciences, calls the signing an “encouraging” step forward. But he notes that the United Nations Framework Convention on Climate Change was adopted in 1992, and theKyoto Protocol was signed in 1997, but never ratified by the U.S. Since then, he said, the world has emitted more carbon dioxide than even the highest expert predictions at that time. The Paris Agreement‘s commitments are voluntary, he noted, with no mechanisms for enforcement, and its goals are modest. But he wondered about the agreement’s focus on renewables — mainly solar and wind — rather than other options such as hydropower, fossil fuels with capture of carbon emissions, and especially nuclear power. She described the agreement’s more than $100 billion pledge per year to help developing countries enact new technology and mitigate and adapt to a changing climate as inadequate. 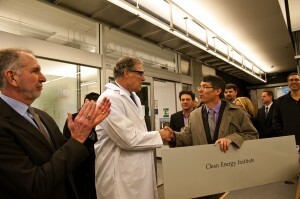 He noted that Washington state has already invested in the Clean Energy Institute and other efforts that join university researchers and national labs to develop new materials for renewable energy and integrate them into the electrical grid. Salina Abraham, a UW undergraduate in environmental sciences, forestry and economics who attended the summit as part of the International Forestry Students’ Association, said “to me, the signing of the Paris climate agreement is a signal — the sound of a call from the global world to this generation’s young professionals and students. Abraham recalls meeting people from around the world during her time in Paris.